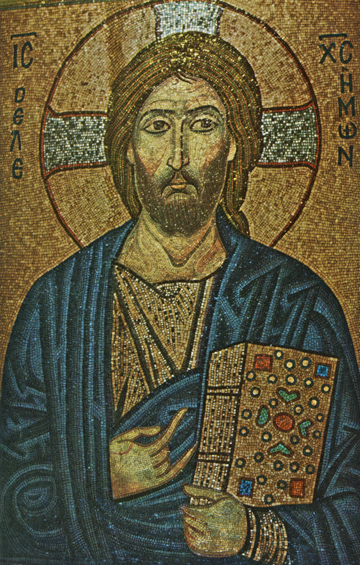 This icon is a 12th c. mosaic whose title, written in Greek on the sides of His nimbus or halo, is “Jesus Christ the Merciful.” The original is approximately two feet tall and its very high quality combined with its particular style indicates that it was probably made in about a.d. 1100 in the workshops of the capital of Byzantium, Constantinople, the Queen city of the Eastern Roman Empire for over a thousand years. The use of mosaics in Christian iconography goes back to at least the fourth century and was extensively used in both East and West, with some of the best examples still to be seen in the churches of Ravenna, Italy and in Constantinople. Often mosaics were used directly on the walls and floors of churches, but the iconography was never put on the floor where someone could walk on the holy images. The use here of a portable icon in mosaic was not as common, but still done in Constantinople’s icon workshops at that period. Christ gazes inwardly, pointing us to where His Kingdom remains. Let us follow Him in love to our true home.